It’s time to celebrate love and romance with hearts, flowers, chocolate, and for some, a lot more. Unlike last year, this year’s Valentine’s Day is a better time to celebrate love and commitment. 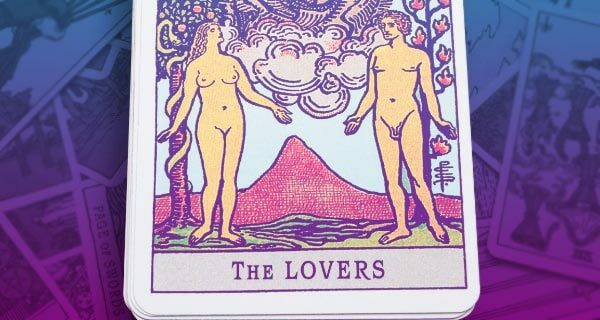 This week, we’re returning to The Lovers’ Tarot by Jane Lyle for guidance. 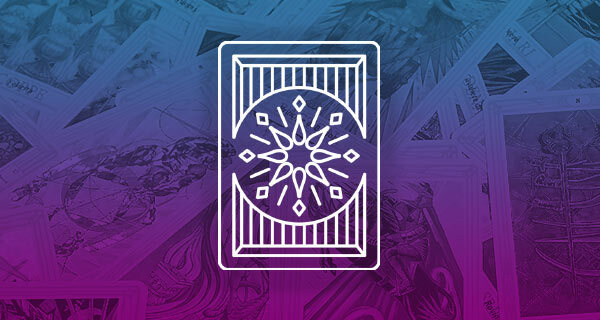 She just uses the Major Arcana cards, and for each card, there are four sections: About You, About Your Partner, About the Relationship, and About the Future. And with that, let’s dive deep into The Lovers’ Tarot. Day (XXI – The World [Reversed]): The World is completion and union. On this card, a naked woman dances joyfully, encircled by a wreath of leaves, representing Sophia, goddess of wisdom. She is surrounded by the Cosmic Egg. The World has not lost its glory but has merely slowed down a little. About You: You’re aware that you’re reaching a turning point in your life. You may even be sensitive to such changes long before they are ready to happen. The World also has a deeper meaning for you now. It symbolizes the penetration of matter by Spirit, the alchemical inner marriage. As a result, you are responsive to subtle changes within yourself. You may feel impatient or frustrated too. You are also on the brink of a new cycle, according to The Lovers’ Tarot. Evening (XV – The Devil): A forbidding figure, The Devil presides over the world of form and matter. His leathery wings remind us that he was once angelic Lucifer, the light bringer who fell from grace. The Devil represents visceral experiences. 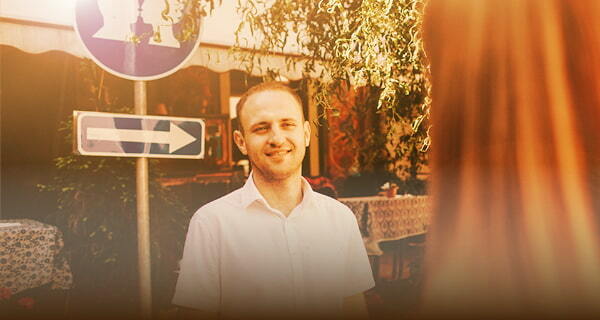 About Your Partner: You cannot ignore your partner’s powerful presence. Indeed, your attraction for each other borders on the obsessive. A generous lover, your companion enjoys sharing his or her success. This person has an instinct for what is pleasing and beautiful. You may even find yourself forgiving them for almost anything. Your partner can be jealous, possessive, and passionate. Yet, The Lovers’ Tarot says escape is unlikely. Day (IV – The Emperor [Reversed]): In the Emperor, we see masculinity, maturity, and fatherhood. He has climbed the mountains and conquered adversity. The Emperor symbolizes the spiritual warrior, ambition, and structure too. About the Relationship: There is something calculating about this relationship. One or both of you may be using the other for status, security or ego-boosting. Emotional satisfaction is sadly lacking currently. Power struggles of any kind may also occur now. You’re both battling for control of the relationship and its direction. And you both think you’re right. However, only a radical change of attitude can release the tensions here, according to The Lovers’ Tarot. Evening (VIII – Strength): Strength symbolizes an enduring partnership between awareness and instinct. This card portrays a lovely young woman, the picture of femininity, as she tames the powerful lion. She is not afraid, for the lion is neither aggressive nor threatening. About the Future: Strength is coming to your aid now. You may find an influential and generous friend who can champion your cause. Or, you may find someone who empowers you to fight for yourself. Since Strength relates to our animal instincts, as well as our faith and love, it can literally signify a very special animal entering your life. The Lovers’ Tarot says your relationship with this creature will certainly open your heart and bring you much joy and happiness. Day (XVI – The Tower): The Tower symbolizes revolution, destruction, and all changes of a dramatic nature too. Against a brooding, stormy sky stands a tall tower on this card. A great flashing bolt of lightning strikes, sending shivers down the entire edifice. About You: Like the rumble of distant thunder, your need for change is becoming ever more insistent. You may dream of apocalyptic scenes, untamed animals, rebels, and more. Part of you knows that upheaval is necessary now. But change is threatening, for it implies uncertainty. Therefore, it’s more than likely you’re resisting these forces. Indeed, you may not even be aware of them. However, by becoming aware of the need for change in your life, you may be able to avoid destructive events, according to The Lovers’ Tarot. Evening (XIX – The Sun [Reversed]): Worshipped for millennia, the Sun is linked in myth and astrology with the core of the higher self. The Sun symbolizes all that is glittering, great, and joyful too. Several children are depicted on this card, representing new life, innocence, and the dawn. About Your Partner: When The Sun appears reversed, your partner is ignoring you. This is likely to be for career reasons. Cheating or deep doubts about the relationship are unlikely. Driven by a need to succeed and to gain the world’s attention, he or she lacks the energy for a full relationship now. However, when some worldly acclaim has been gained, there will be time for you once more, according to The Lovers’ Tarot. 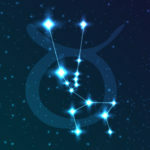 Day (XVII – The Star): The Star is symbolic of Aphrodite, the Greek goddess of love, and Ishtar, goddess of healing and eroticism. A beautiful, naked woman kneels beside a pool of clear water on this card. She pours water back into the pool and on to the earth where she kneels. It is a still and starlit night. About the Relationship: Your relationship is balanced and harmonious, centered in the present moment. Perhaps it has just begun. Your feelings are mutual. Your happiness is spontaneous and childlike. As a result, there is no need to make plans just yet or worry about the past or the future. If you’re already in an established relationship, The Star promises a renewal of love. Hope and redemption have triumphed too, and whatever has dogged your love in the past is now fading away. This is certainly a balanced partnership on every level. You both seek to bring happiness to the other. Evening (III – The Empress): The Empress is abundance and fertility. Her mythic links stretch back to the goddesses of nature and she rules over the fruits of the earth too. The Empress is the Full Moon, the Sun at midday; she’s harvest time and fruition. 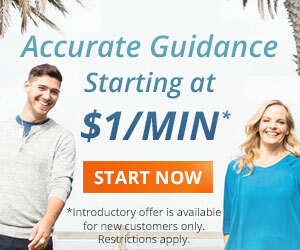 About the Future: You’re about to experience a time of abundance in your life. Through harvesting the fruits of past efforts, you can expand and develop creatively and materially. Even if you’re alone, which is unlikely, your sense of being in love with life is so powerful, it lights up your days and nights too. Day (V – The Hierophant): Otherwise known as The Pope, he is the bridge between aspirations and achievement. He rules resources on both material and spiritual levels too. About the Relationship: This card appears today to indicate a commitment, usually in the form of marriage or engagement. It can also represent a kind of public recognition of your relationship. The true meaning of marriage as a sacred bond is also indicated here. Each person learns and benefits from the mysteries of the other, just as in an ideal marriage, each partner cherishes and enriches the other. Evening (XIII – Death): Death embodies the concept of change, transition, and regeneration too. Death affirms rebirth and the promise of the soul’s eternal life. About The Future: A brand-new life waits in the wings. Far-reaching changes are taking place deep within you too, as you shed all that is outworn in your present life. This powerful process is slow but once complete, you’ll look back on the dark days as if they were a dream. You will truly be reborn. Day (VI – The Lovers): The Lovers embody the idea of opposites attract. The Lovers represent choices, romance, and union too. About You: You’re at an interesting point in your life when this card appears. Love, marriage, and romance could be on your mind. The Lovers indicate that you could see your dreams come true soon. There is also a deeper meaning: This card indicates both male and female energies. Therefore, you are neither overly aggressive or dangerously passive, which bodes well for both your love life and any creative endeavors you’re planning. The Lovers’ message is to throw away the rule book. That’s because conventional views don’t belong in your life right now and your instincts are leading you in the right direction, so rely on them. Evening (0 – The Fool): The Fool, card of beginnings, stands at the gateway. 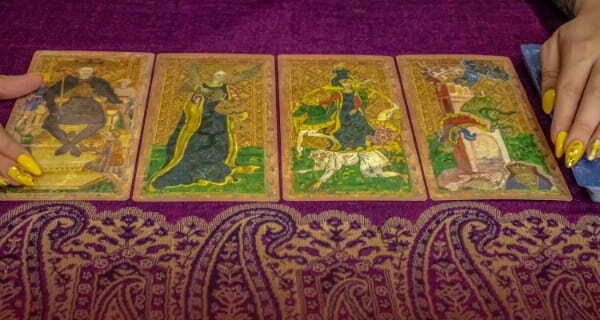 With shining optimism, he sets out on the spiritual journey represented by the cards of the Major Arcana. Revolutionary Uranus rules this card, underlining its message of change, freedom, and adventure. About Your Partner: Someone represented by The Fool promises to be unforgettable, unconventional, and challenging. Their social or cultural background is likely to be very different from your own too. Often, The Fool symbolizes a partner who is much older or younger than you. Together, you will discover the playful side of love, for this person loves to have fun and longs to make you laugh. Day (XIV – Temperance): Temperance symbolizes continual change. Temperance is linked with Sagittarius, the sign of the higher mind and universal awareness. It unites male and female qualities. Temperance is also the essence of harmony. About The Relationship: Temperance can signify the calm after an emotional storm. 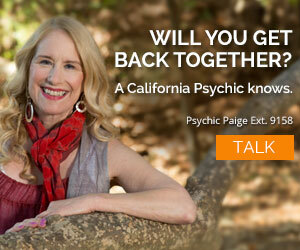 It can also signify a mature awareness of your partner’s needs and wishes. Temperance also denotes the fusion of intuition and logic. This card is linked to tantric sexual practices. At the core of this philosophy is the idea of spiritual ecstasy and transcendence through love. So deep down, your relationship contains a magical potential for sexual alchemy. Via the heart, mind, body, and soul exchange, the couple rises above any differences or conflicts. The love is transformative, according to The Lovers’ Tarot. Evening (XI – Justice): Jupiter symbolizes mental balance and her open eyes view life with clarity while her mind is calm and detached. Ruled by Libra, the sign of balance and partnership, Justice emphasized the importance of perspective and objectivity and reminds us that for every action there is a reaction too. About The Future: Justice argues for resolution. A favorable decision will be made, and you will certainly be able to proceed with your life. Legal documents are often suggested. For example, you may be getting married, buying a house or signing some other important contract soon. i would like to know if im getting back together with a former lover i have found,and could you tell me my lucky numbers.